If you are planning to move residencies, take the stress away and call us to move your belongings. We can help you prepare for your move before a box is even packed. Our trained team can make a strategy with you that will be strictly followed, that way you will always know what is going on. Our movers are trained and very trustworthy. We want to make the process as simple as possible. Your boxes will packed from the original house and correctly placed in the new house so you just have to set up the new house as you would like. Our team can move the large, heavy, and awkward things to carry so you do not have to. Whether is is an inch to the right or an inch to the left we want to put everything exactly where you want it. Picking up and moving your life is not an easy endeavor to undertake. We understand this. For that reason we pride ourselves on being a trustworthy, family owned and operated company. Relocating is our job, but moving you is our specialty. 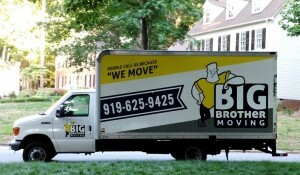 Big Brother Moving is a Cary, NC based moving company established on pride and hard work ethic, reliable service and 100% customer satisfaction. What separates us from our other local small business competition is the level of quality and our affordable rates. Founded nearly 5 years agao, we have plenty of moving experience and 1,000s of small and large moves. Big Brother Moving provides the highest quality professional moving and packing service, so give us a call today or submit an online form to receive a FREE ESTIMATE!